A*P*E Blu-ray Cover Art and Full Features Revealed! In 1976, as the world steadied itself for the impending elephantine Dino De Laurentiis remake of King Kong, another giant monkey movie thundered into theaters, armed with a total production budget that the Dino flick only spent on bananas. 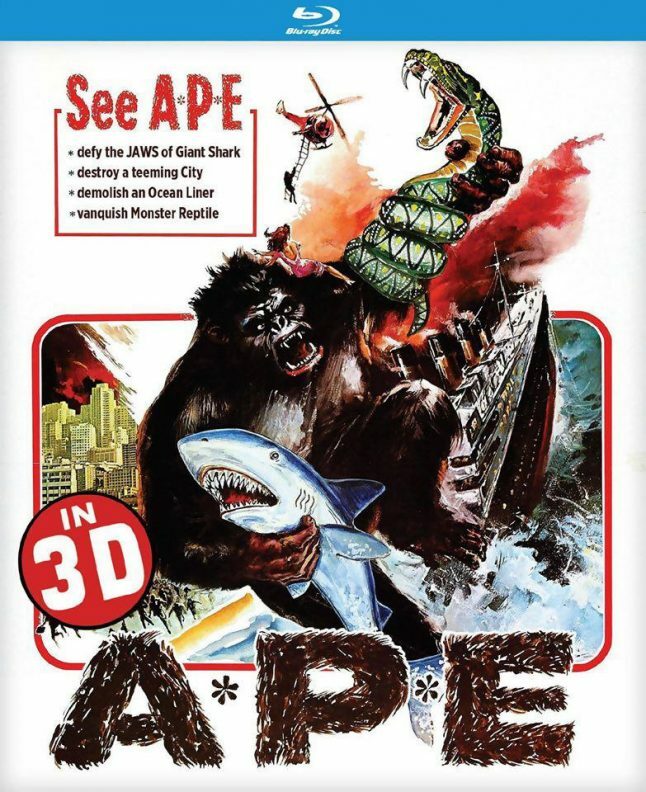 That film was Paul (I Dismember Mama) Leder‘s deranged 3D Kong rip-off A*P*E, originally titled The New King Kong and then, because of a promised lawsuit, quickly changed to the current title. Now, A*P*E stands for “Attacking Primate MonstEr.” That’s right, Leder and his merry band of misfits couldn’t even bother finding a word that began with E for the acronym. No matter, as that bit of half-assed goofiness is one of dozens of memorably-daft moves that define the enduring appeal of A*P*E, a film that was financed by Korean producers and because, y’know, M*A*S*H was set during the Korean war, the title kinda made sense. Or something. This writer LOVES A*P*E. It’s crazy. Look at the still above! 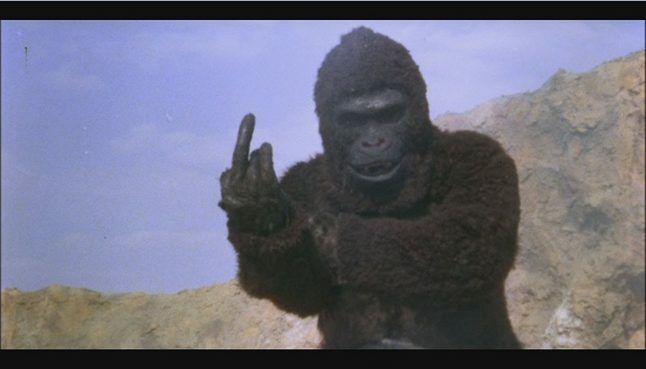 No other Kongsploitation movie features the shag-costumed simian heavy inexplicably stopping its reign of terror to turn to the camera and give the audience the finger. And yet A*P*E is otherwise played like a straight Kong remake. Except… well.. .it’s A*P*E! Kino Lorber starts 2017 off with a BANG by releasing A*P*E for the first time on Blu-ray in fully restored 3D, a major event for fans of awesomely sincere and inept downmarket horror and fantasy filmmaking. The movie comes stomping to stores and online outlets on February 28th and we got a look at the full features and Blu-ray cover below. *Audio Commentary by Horror Cinema Historian Chris Alexander… yes that’s correct. THIS WRITER did the commentary! Wheee! And watch the anaglyph 3D A*P*E trailer below (requires them beautiful red/blue 3D glasses to fully enjoy).